In the Groups > Files section you can add, edit and delete files that you want to make accessible to group members. Access to files is restricted by group membership. To be able to download a file, a user must be a member of a group that is assigned to the file. 1) Select the New File option at the top of the screen. 2) Add the desired file. 3) Select the groups you want to access the file and hit the Save button. You can also setup an access limit for the file. The user must have accessed (downloaded) the file fewer times than the file’s access limit. The default setting #0 grants unlimited accesses per user. 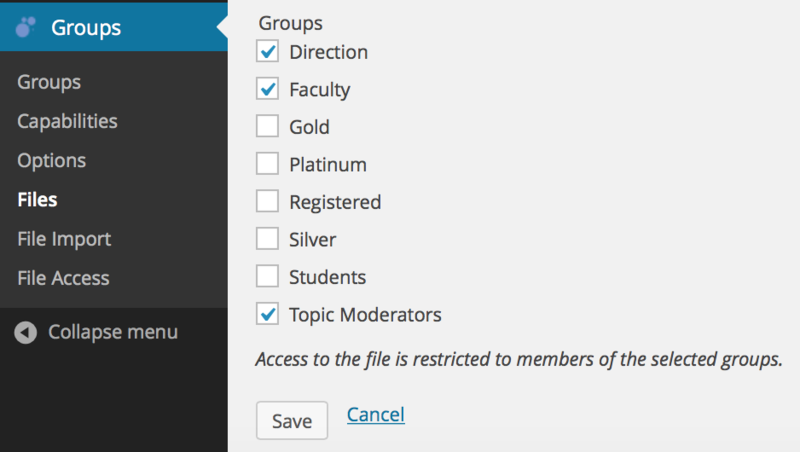 If you want to restrict access to a file to users that belong to a certain group, create the group, add the desired users to the group and assign the group to the files that the group should be able to access. More than one group can be assigned to a file. Use the filters to restrict the files displayed in the file list to those that match the given criteria. Note that the filter settings are persistent, i.e. if you leave the screen or log out and come back, the same settings will be in effect. Click the Apply button to use the filters and the Clear button to remove all filters. For example, the [groups_file_link] shortcode renders the actual link to a file that authorized users can click to download the file. Please refer to the Shortcodes page for detailed information.